An excellent hide or humid hide for your gecko. My little leopard gecko Squanchy LOVES this. It can be difficult to keep a humid hide in his vivarium at times so this is perfect - it makes it easier to remoisten and gives him a better area for shedding. 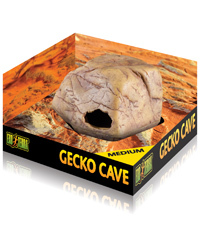 Great cave for the humid hide for my Leopard Gecko, highly recommended. opens up so easy to access and dampen the moss daily.